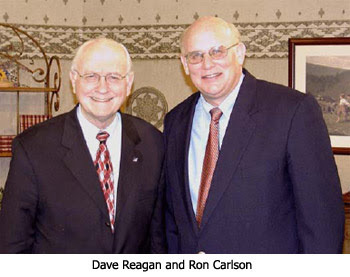 A dear friend and ministry colleague, Ron Carlson, was called home to his Creator on June 16, 2011. He died peacefully in his sleep while taking a nap before dinner. His death was sudden and totally unexpected. He was only 61 years old. He is survived by his wife, Marge, and by two sons, Jason and Jared. His sons are both ordained ministers and will be taking over the direction of the great ministry that God developed through their dad. Ron's ministry, called Christian Ministries International, was founded in 1975. The name proved to be prophetic because Ron taught and preached the Word of God in a total of 90 nations on six continents before his death. The ministry, which his capable sons will continue, focuses on evangelism and apologetics. The ministry's theme verse is Jude 3: "Contend earnestly for the faith." And that's exactly what Ron did in his writings, teachings, and sermons. He had an overwhelming passion for the Word of God — for studying it, proclaiming it, and defending it. At the time of his death, he was deeply concerned about the fast-growing and swiftly-spreading apostasy in the Church. Ron was one of the gentlest, kindest persons I have ever known. He had great compassion for the victims of spiritual deception, and he had an overwhelming zeal to reach them with the Gospel. I had the privilege of ministering with Ron at many conferences. He was one of the featured speakers at our Spiritual Apostasy in the End Times June 2009 Conference. On two occasions, he came to our headquarters to be interviewed for television programs. During those memorable visits, we recorded a total of six programs which were later published as two video albums, one on the cults and the other on the major world religions. We have always stocked his remarkable book, Fast Facts on False Teachings. It contains an overview summary of the beliefs of the major Christian cults and the leading world religions. The Body of Christ is going to greatly miss the truthspeaking voice of Ron Carlson. Let us pray for his mantle to be passed to his sons. I am so sorry Dr.Reagan has lost a good friend and another little family has lost a beloved member. Thankfully you all know this is a short parting. Hubby and I seem to be losing friends at an alarming rate these days; another funeral of my former school prefect on Monday. Most we know nothing about their eternal state. On a lighter note; this reminds me of a little tale told by Bible teacher the late Roger Price. He was visiting an 'ancient' sister in Jesus who was feeling a mite lonely. Roger advised her to "go and 'look up' some old friends for company". To which, the old girl replied "Look em up! You mean 'dig em up' don't you"! I was sorry to read this. Though I did not know Mr. Carlson, I did see him in some L&L programs. Sad loss for this world. Glorious time for Mr. Carlson.